Villa Jane is the most fabulous and exclusive villa in Los Gigantes. It is situated in an enviable position with views to the cliffs of Los Gigantes and stunning sea views across to La Gomera and La Palma. 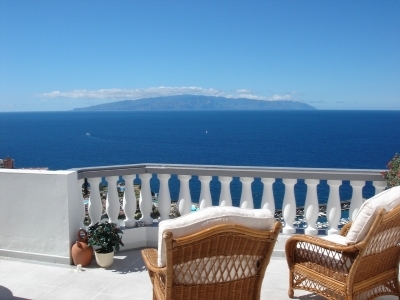 Yet the villa is only a 4 minute leisurely walk into the centre of Los Gigantes and a 5 minutes walk to the beach. There are four bedrooms and three bathrooms, but the villa can sleep up to 10 people with 2 z-beds for the younger party members. Cots can also be provided on request. Most of the bedrooms have sea views and two of them have direct access to the terraces, as well as ensuite bathrooms. Outside the villa has a private heated pool, which can be heated on request for a small additional charge. The villa is very well equipped including air conditioning, wifi internet access, satellite TV, DVD, CD and video players, as well as an MP3 dock. x 3 - all the bathrooms have been refurbished with state of the art showers, baths, wash hand basins and toilets, as well as new tiles. One of the bathrooms has a 5 foot illuminated mirror and the other two have illuminated vanity units.